On the 20th December 1948 an Avro Lancaster (PA411) crashed into Tintwhistle Knarr on route back to its base at RAF Lindholme after a night training flight. The plane was heard by locals flying in low cloud up the valley. 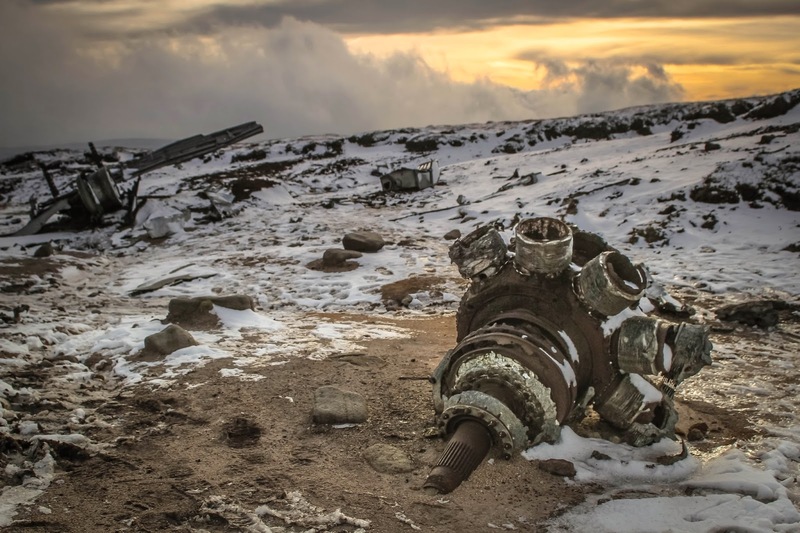 A few moments later a vivid flash could be seen closely followed by an audible crunch of metal as the aircraft came to grief on the rock strewn peaty moor. An orange glow filled the cloud around the crashed aircraft as the fuselage and wings burned fiercely. Locals having realised what had happened rushed to the blazing wreck to see if anything could be done. First on the scene were the male members of the Bagshaw family, John and his sons Jack, Basil, Neville and Ernest. It took them only thirty minutes to reach the wreckage from Old Road, Tintwhistle. Yet what awaited them was a scene of devastation. The pilot must have seen the moor at the very last moment and attempted to make the aircraft climb away from the danger, too late the nose rose, but the tail hit the ground breaking off the whole tail section from just before the aircraft's doorway. The aircraft's recovery then stalled and the main fuselage of the Lancaster smashed into the moor and exploded in a ball of flames. 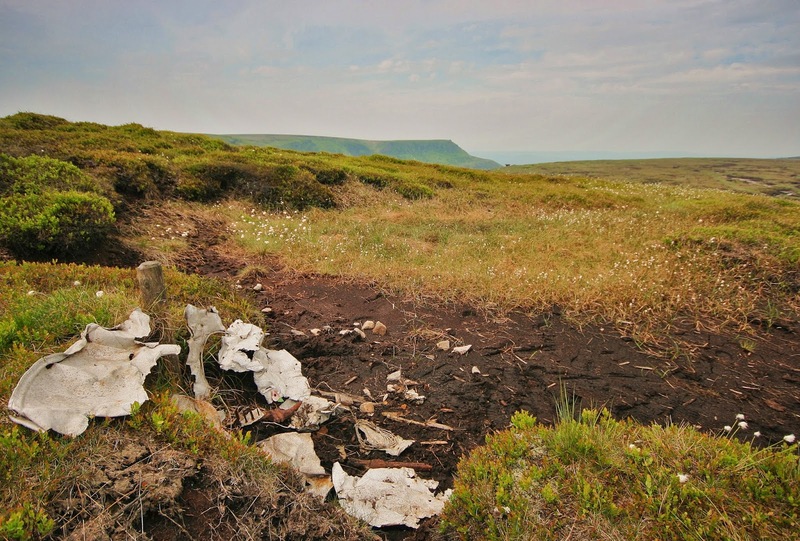 Contemporary photographs taken the day after the crash show an almost intact tail section sat upon a peaty mound with the rest of the aircraft destroyed in the distance behind it. The first crew member they came across was the person whose post was Tail-End Charlie on this training operation. It is assumed that this was Sergeant William Allen Love who was a signaller. He preferred to be called Allen rather than William. Sgt.Love was still alive when the would be rescuers arrived. He was to die in the arms of Mr Bagshaw. Sgt Love's watch had stopped at 10 seconds to midnight which must indicate the exact moment the Lancaster slammed into the moor. The rest of the 7 man crew were either engulfed in the fuselage or lay dead, scattered around the burning aircraft. 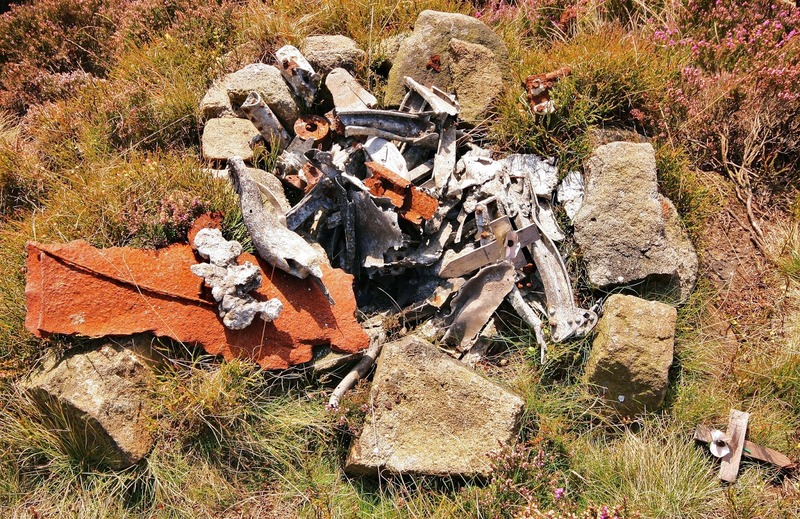 It was most likely the usual Peak District crash site case of the aircraft being too low, in cloud and perhaps they believed they were somewhere other than over the Dark Peak. 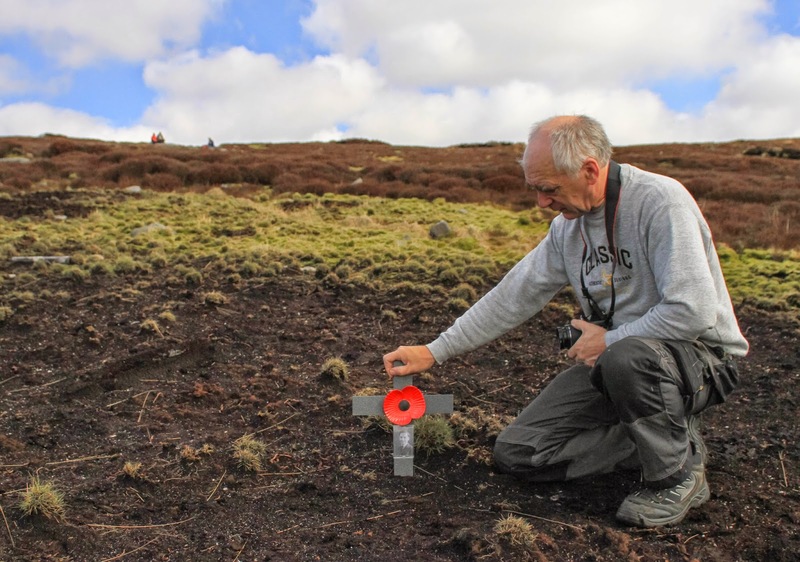 Roll time on 67 years and a series of events leads Sgt Love's great nephew Mr Barry Love to this tragic section of moor above Longdendale. Barry inherited a group photograph on a family members death and from this starting point, a picture dated 1941 of the three brothers dressed in uniform the search began. Jack(Barrys Grandfather) and James were both Flight Sergeants in the RAF, an Observer and Air Gunner respectively, whilst Allen too young to join up in 1941 was pictured in an ATC uniform. In 1942 the Wellington in which Jack was flying had to crash land in Northern France. Jack walked 290 miles and made it to the Swiss border where he was captured by the Germans and detained as a POW for the remainder of the war. He passed away in 1997 aged 85. Unfortunately James was killed in action when his aircraft, Handley Page Halifax LK762, was shot down during a March raid on Nuremburg in 1944 by a fighter using Schrage Musik (flying underneath the bomber and firing a vertically mounted gun into the fuel tanks of the bomber). It was James first op on his second tour of duty. The third brothers fate (Allen) was very much an unknown to Barry and became the quest. In the first instance Barry searched through the Births Deaths and Marriages register finally finding a person with the same name registered as dead in Cheshire. Another photograph turned up of a young man now dressed in a RAF Air Gunners uniform , it was signed on the back ''With Love to Mum and Dad from Allen''. Could this be the boy in the group photograph dressed in ATC uniform? Here the trail grew cold until Barry contacted a Mr Jim Sewell who, with access to the Armed Forces personnel database, found more information on how Allen had met his end. 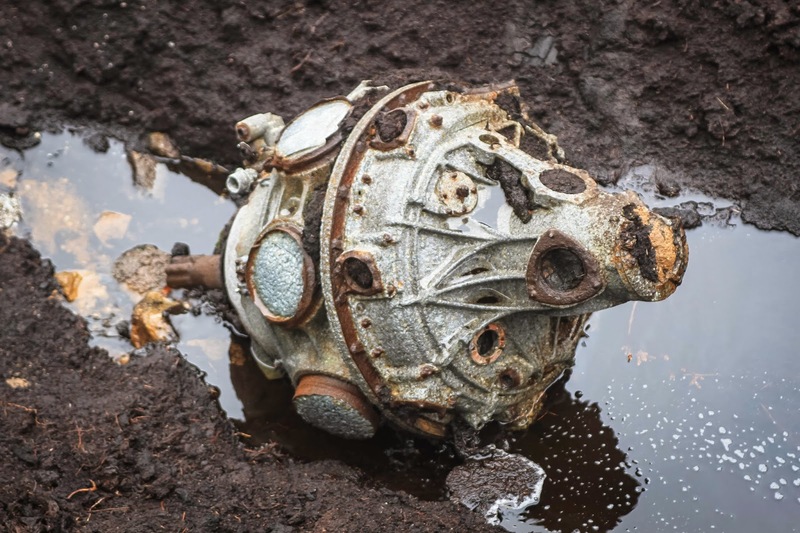 The Lancaster crash was noted and this led to a search of the internet where they came across some photographs of the scene taken by myself, Paul Johnson. I was able to later confirm that these were of PA411 and that it was indeed the aircraft of Sgt Love. Barry then placed an advert on Glossop.com for anyone who may have further information. 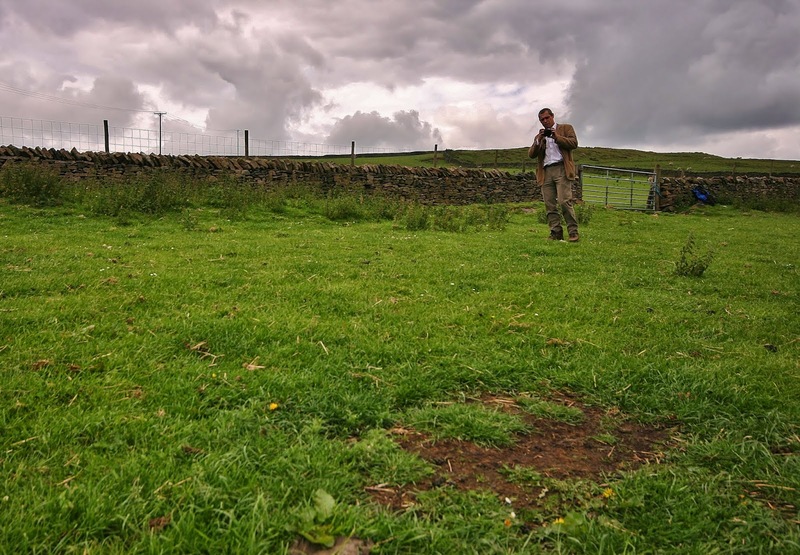 There was an immediate response from well known local aircraft crash site historian Mr. Norman Winterbottom. A meeting was arranged and Barry, Norman, and myself were joined by aviation archaeologist Mr. Kevin Brown and his partner Lynda, along with the TV Aircraft Crash Investigator Garth Barnard. On the arranged date Sunday 5th April, this small party made its way up the moor in perfect weather listening intently to Norman's insight to the crash and to Barry's explanation as to how we had all arrived at this point. At the crash site, respects were paid to the crewmen and we all discussed the crash and attempted to visualise the scene and how the crash had panned out. 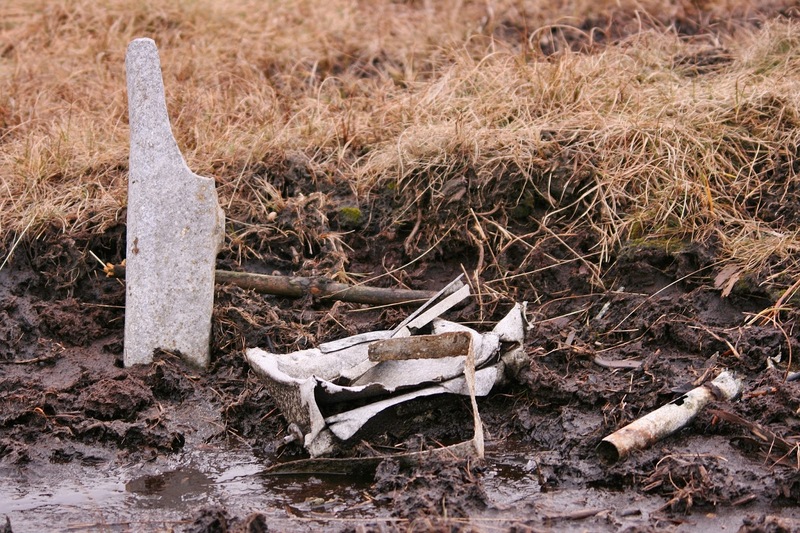 A crash site visit is always poignant never less so than when in attendance with a family member of the deceased crew. It was a moving occasion. Some of these men survived the war yet perished on an unforgiving hillside in the bleakness of a winters night. Despite being a truly tragic tale there is now a sense of closure for Barry and his family. 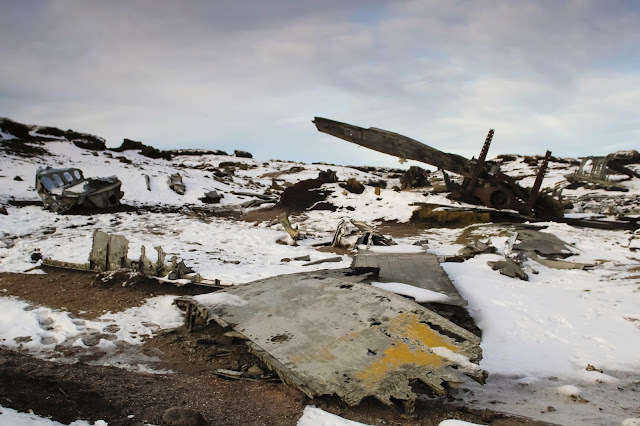 On our way down from PA411 we visited a P-38 crash site and the site of the 3 Hurricanes that also crashed on the Knarr. It was a reminder, if we needed one, of the many sacrifices made for us by men we will never know. Barry would like to thank all parties for attending on the day and in particular Jim Sewell for his valuable research and Norman Winterbottom for relating the in depth knowledge of the happenings of the night of 20th/21st December 1948. On the 11th December 1944 , this aircraft flying from RAF Newton to RAF Millom and piloted by Flt.Lt. 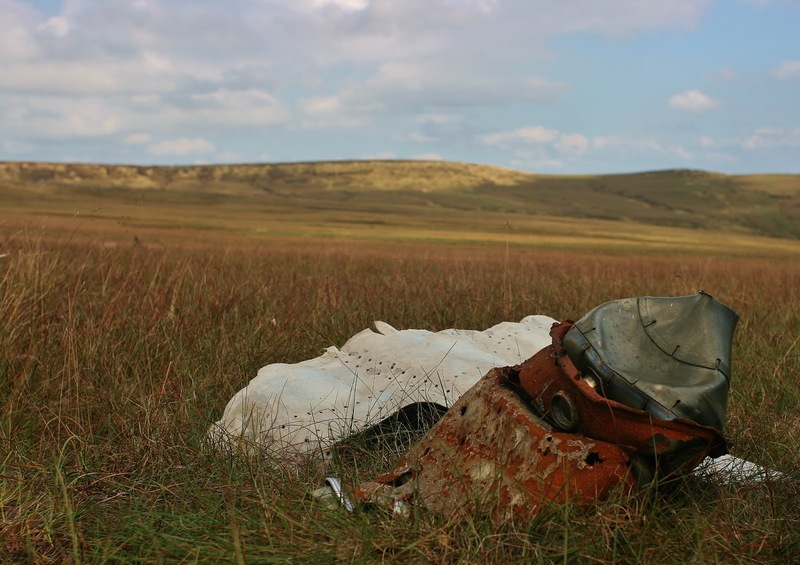 Aleksander Chelstowski , crashed into the plateau on top of Kinder Scout in the Dark Peak . He was accompanied on the flight by his wireless operator a Flt Sgt Stefan Pasinski and 4 passengers . Happily all survived the crash on the snow covered top . After a couple of clearances little remains apart from the two engines and a few panels . I,ve visited the site on a couple of occasions . Never in very clement weather though . Our last visit was in pouring rain ,our first in snow and low cloud . 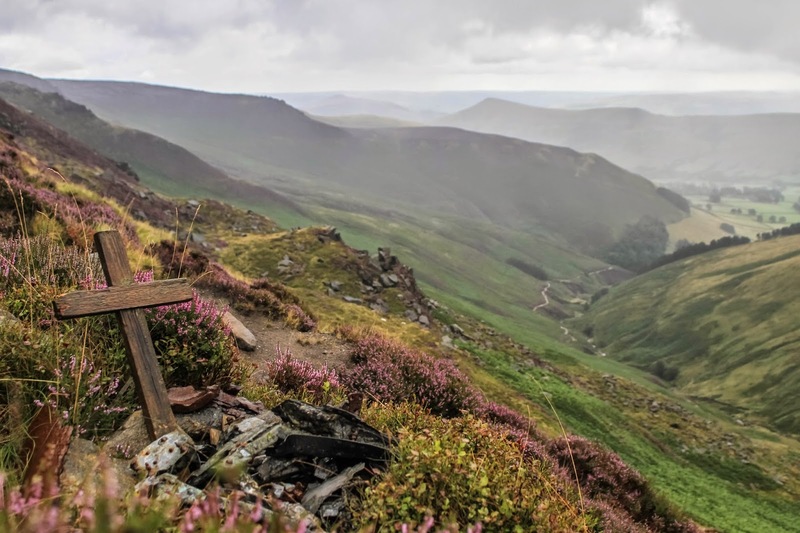 On the 31st July 1941 Wellington W5719 crashed into Kinder Scout in the Peak District . It was returning from a raid on Cologne ,Germany . It is alleged that the bombs had not been dropped due to cloud cover over the target and that the aircraft was returning to RAF Snaith in Yorkshire . That night there was also low cloud over Northern England and their location must have been misjudged because they flew beyond the airfield and into the flank of Kinder Scout . 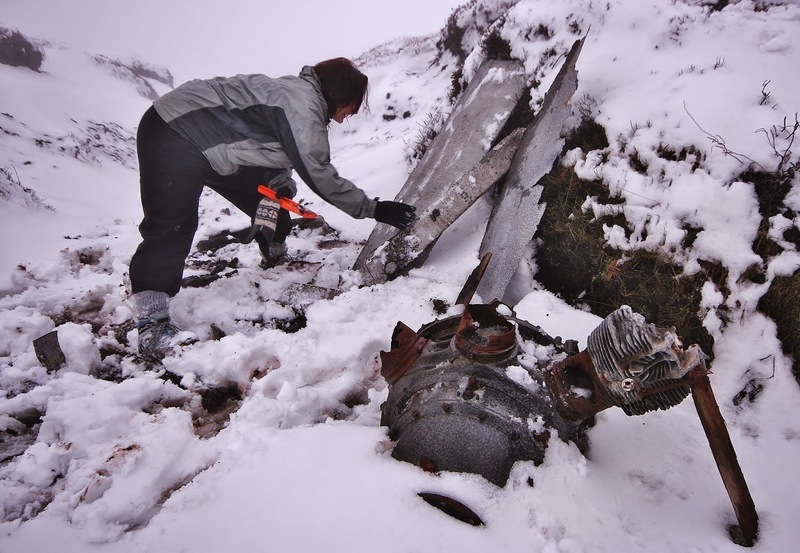 On impact the bombs exploded flinging the rear turret away from the aircraft and down into Grindsbrook Clough . In the rear turret the very fortunate Rear Gunner Sgt Earl Tilley survived . The other crew members all died in the impact . Sgt Evelle was a Canadian . The pictures below show the site just below the perimeter path . Little remains today , small fragments and lumps of molten alloy . There is a small cross and plaque dedicated to the men . 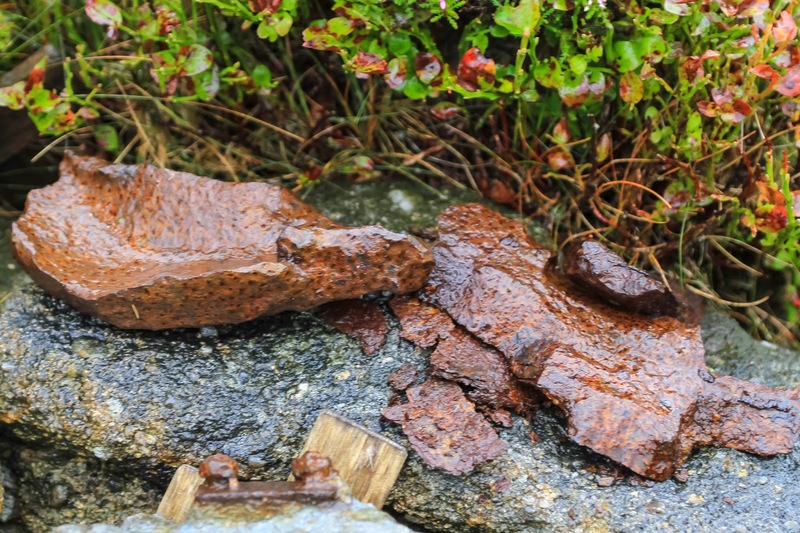 On a recent visit I realised that some of the debris left at the crash site was bomb casing fragments from exploded bombs . There are sources that say the aircraft had dropped its bombs . These fragments at the very least prove that they didnt drop all the bombs . 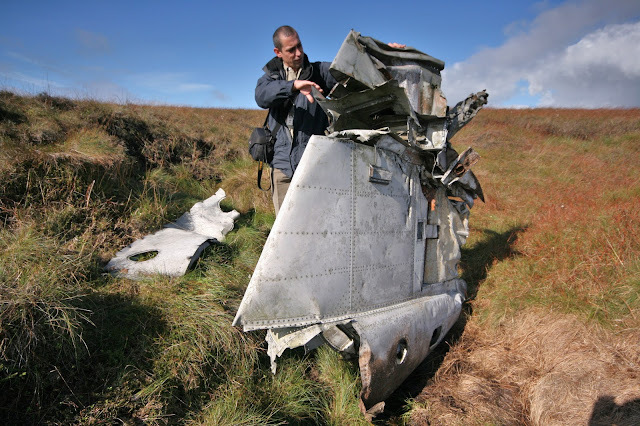 On the 19 August 1941 this aircraft crashed into Featherbed Moss near Chew Reservoir in the Peak District. The aircraft was intending to fly to Wales to provide gunnery and searchlight practise for the recruits at Gunnery and Torpedo training base on the Great Orme , click the link to see the base news.bbc.co.uk/local/northwestwales/hi/people_and_places/... . Flying out of Ringway (now better known Manchester Airport) it flew in completely the wrong direction due to the Gyro compass being either faulty or set wrongly. Cloud was down below 2000ft, the pilot realising something was amiss but believing himself to be over the low plains of Cheshire reduced heigtht in an attempt to get beneath the cloud . He never made it . 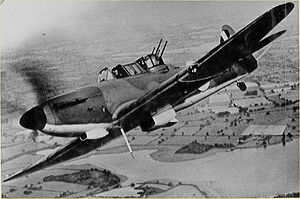 The Lysander had a crew of two . Both men survived the crash itself but were not found for a couple of days . They were trapped in the mangled wreckage , which ultimately proved fatal for the Wireless Operator who died in hospital 5 days later probaly due to the build up of toxins in his trapped body . LAC Allen M. Chadwick Wireless Op. Died in hospital on the 24th August 1941. CWGC has Leading Aircraftman Chadwick , who was 22 years old , buried at Bebington in the Wirrel . The aircraft itself was built as a Mk.IIIA by Westland in Yeovil. 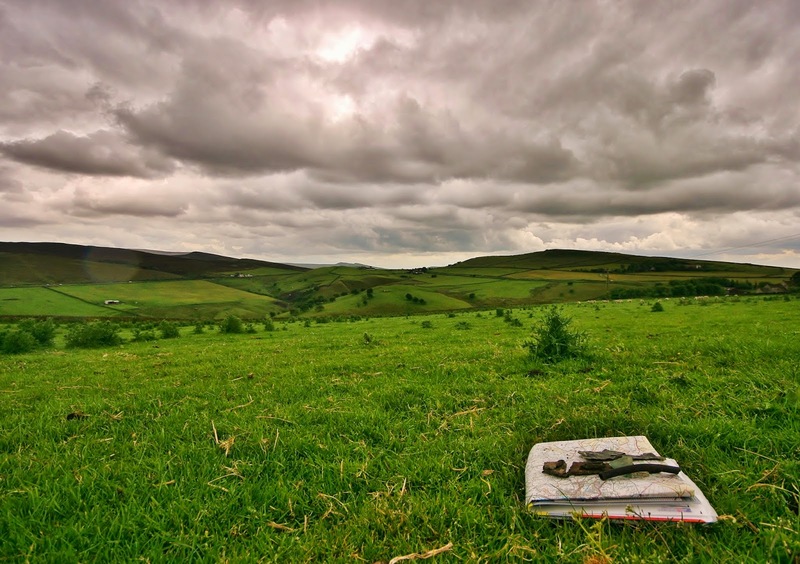 The crash site is on a featureless moor , very little remains and it can be difficult to find with a map and compass . I managed but probaly one for a GPS in truth . 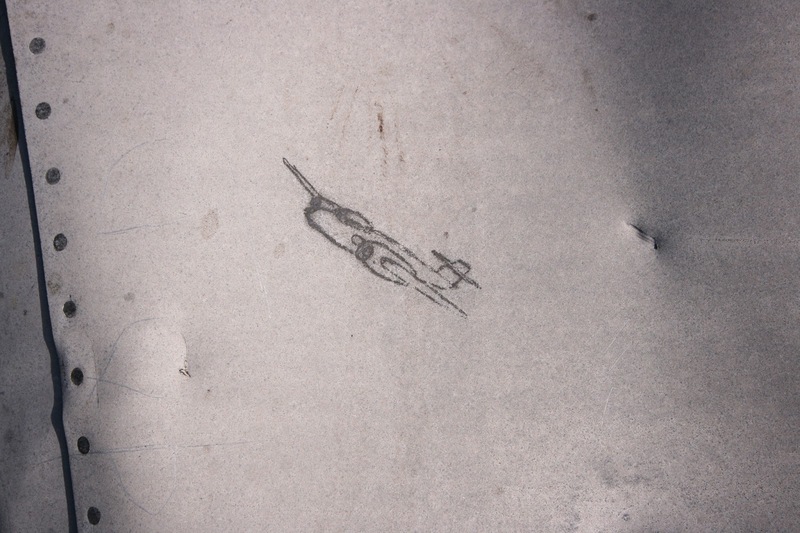 That said it makes part of a good wrecksite round along with a nimber of other aircraft in the area . Flying out of RAF Sealand on the 12th April 1945 , the pilot lost control of the aircraft in cloud crashing into the moor , Blindstones Moss, near Chew Reservoir on the edge of the Peak District. The pilot was killed . Not much remains at the site now . It is easily accessed from the resovoir road . Harder to find is the nearby Lysander V9403 . 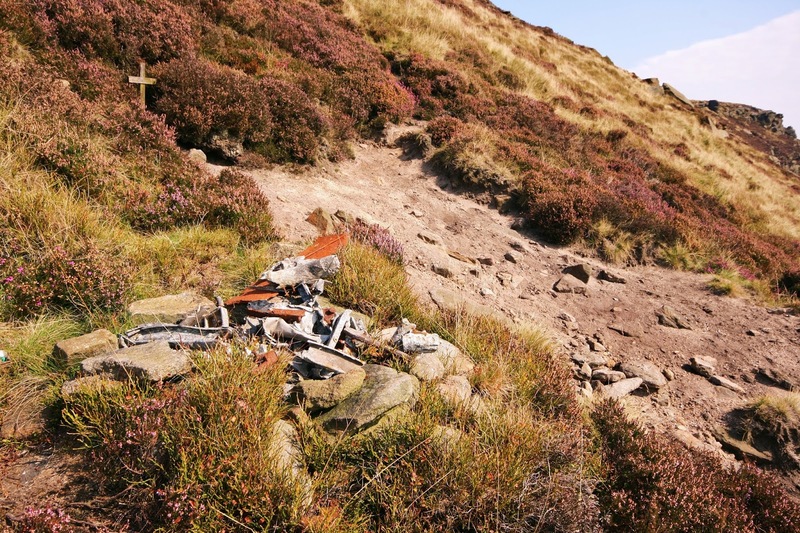 A well put together walk can take you to 5 crash sites in the space of a few miles above Dovestones Res ! Flying out of Debden in Essex in a formation of 23 Mustangs all being ferried to Speke for shipment to the Far East this aircraft was destined not to make it . Three aircraft descended through the cloud to attempt to get a fix on thier location one just clipped the ground but flew on managing to return to base , the formation leader on seeing the ground managed to climb to a shortlived safety , crashing into a hill a few miles away having another go at trying to discover his location. A site I have previously visited. 44-64084 struck the ground at Plainsteads Farm , near Glossop in the Peak District at 6 minutes to eleven in the morning. The pilots watch had stopped on impact. He served with the 336th Fighter Squadron of the USAAF. There is very little to be seen today at this site . 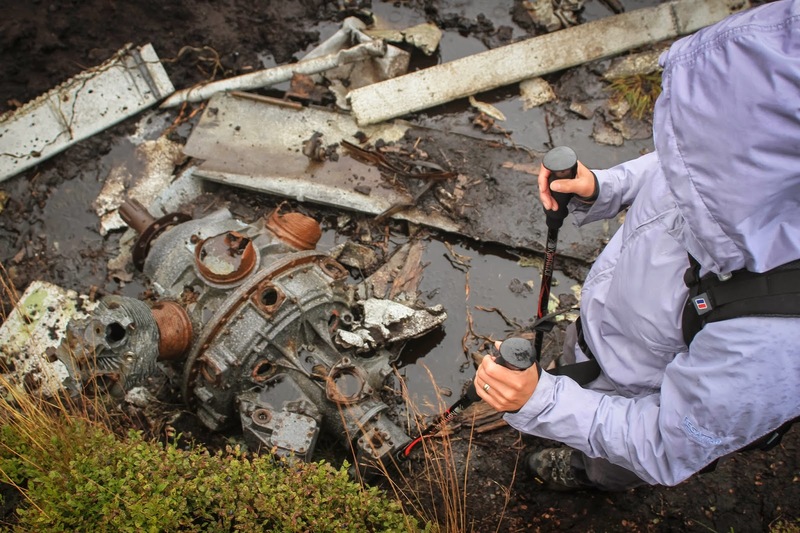 We saw evidence of the crash , some scarring to the ground by a gate in a new wall and a bare patch a little further away which may have been the final location of the engine the ground there still remaining polluted enough to inhibit growth of vegetation to this day. In vehicle tracks that passed through the gateway small fragments of wreckage could be seen . A few scraps of alloy , armoured glass, and a corroded rubber pipe . The site is on private farm land and on talking to the farmer it was apparent that other interested parties had attempted to view the crash site . Apart from one visitor most seemed to have cast thier net far and wide across the field network , with the farmer reporting a number of possible locations to us . There is no doubt at all that we were in the correct location . 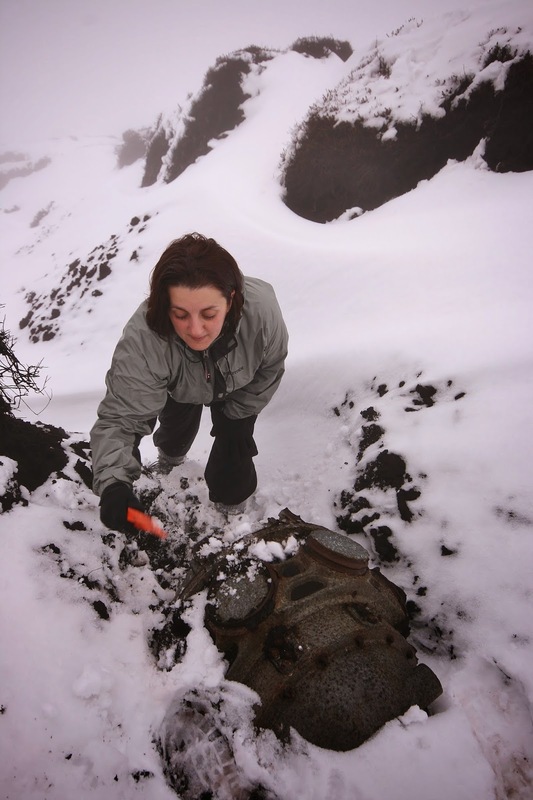 A non intrusive sweep with a metal detector indicated much more fragmentary wreckage would be found beneath the surface . Small fragments of metal are apparent across this feild . The disturbed earth in the foreground seem to contain some stronger signals . Wreckage could eb seen on the surface by the gate in the cattle tracks . On the 3rd November 1948 whilst flying from RAF Scampton to Burtonwood this aircraft crashed in low cloud into Bleaklow near higher Shelf Stones. It had been carrying the wages for all at Burtonwood along with mail for the US. Close by two teams from a mountain rescue unit of RAF Harpur Hill were exercising , on realising that there had been a crash close to them they began a search to find the aircraft . They eventually found the aircraft late in the afternoon . The sight they saw through the enveloping gloom , mist and rain must have been akin to armageddon for the aircraft had burst into flames upon impact as well as smashing open . Bodies of the crew and passengers were strewn across the moor in various states ...some were so burnt as to be almost unrecogniseable , some had body parts missing, some seemed to be simply asleep without any visible signs of injury . 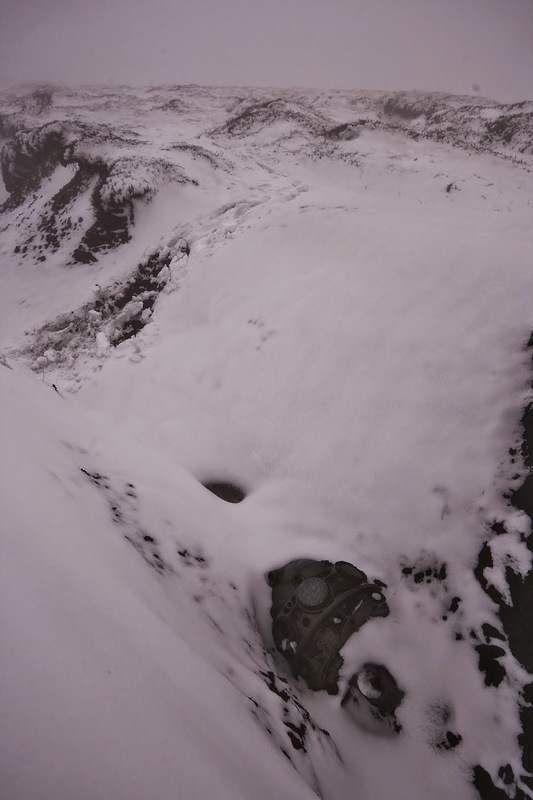 The conditions and time dictated that the bodies were to remain with the aircraft until the following day . It must have been some very sober men who crossed the moor that following morning for their task that day was formidable . Staff Sergeant Gene A. Gartner Radio Op. Staff Sergeant David D. Moore Radar Op. The crew had finished their tour and were due to return to the US just 3 days after the crash occurred. The aircraft itsef was part of a photographic reconnaissance squadron (16th) and as such took part in the Bikini Atoll atomic tests in 1946 hence the name and the number of photographic crew . At 9:15am on Thursday 12th April 1951 a flight of four Meteor jet aircraft took off from RAF Linton-on-Ouse near York for a training flight. Flying the lead pair were Flight Lieutenant David Merryweather Leach (WA791) and Flying Officer Tony Hauxwell (VZ518). The flight was to climb to around 30,000ft where the two pairs would carry out attacks on each other. The weather forecast for the day was for complete cloud cover from 1,500ft to 20,000ft, but on reaching 30,000ft the four aircraft were still in thick cloud and radioed Linton on Ouse to inform them that the flight would be returning home. All four aircraft turned back towards Linton-on-Ouse, though after having descended back through 20,000ft Flt Lt Leach reported he could see what he thought was Leeds through a break in the cloud and he and F/O Hauxwell were going to proceed down. The second pair could not see through the cloud and not being entirely sure of their position radioed their intention to remain at 20,000ft. After some 5 minutes the lead pilot of the second pair, Flying Officer Leslie Hayward, attempted to contact Flt Lt Leach with no success. RAF Northern Radar at Lindholme near Doncaster attempted to contact the pair again with no success. Following this a search was mounted with wreckage being spotted later in the day with a ground team reaching the scene the following afternoon. The two aircraft had continued to descend through cloud and without ever breaking out of the bottom of the overcast and had flown into the top of the moor in formation. The marks left by the two aircraft are still clearly visible. Looks like the sign has been replaced since my last visit , says the same but must be a new one by the looks of things or at very least has been cleaned and had a paint job!. This was one of my earliest crash site visits and I have not done a proper write up of this site .So i am redressing this now ! 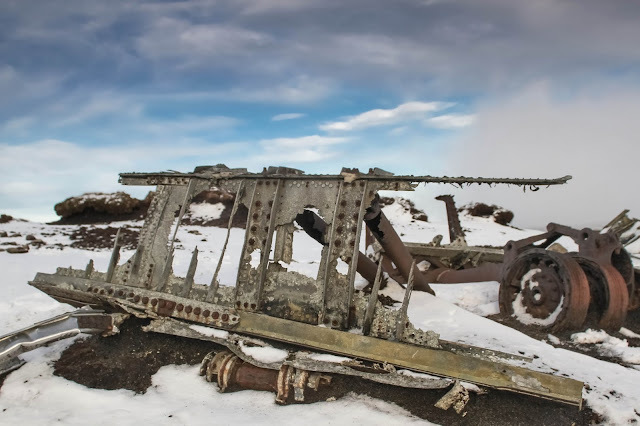 On the 21st January 1942 this aircraft was returning from an abortive leaflet dropping operation over France in bad weather to its base at RAF Skellingthorpe, when it crashed into high ground at Cluther Rocks on the edge of the Kinder plateau . The crew were lost and looking for Ringway Airport and had even been in contact with them before they crashed . The Hampden burnt out and all the crew were killed . On the 17th of July 1942 the crew of Wellington Z8980 flying out of RAF Lichfield on a night navigation exercise bailed out at a low level after losing control of the aircraft. the Wellington crashed into Ringinglow Moss and burnt out . 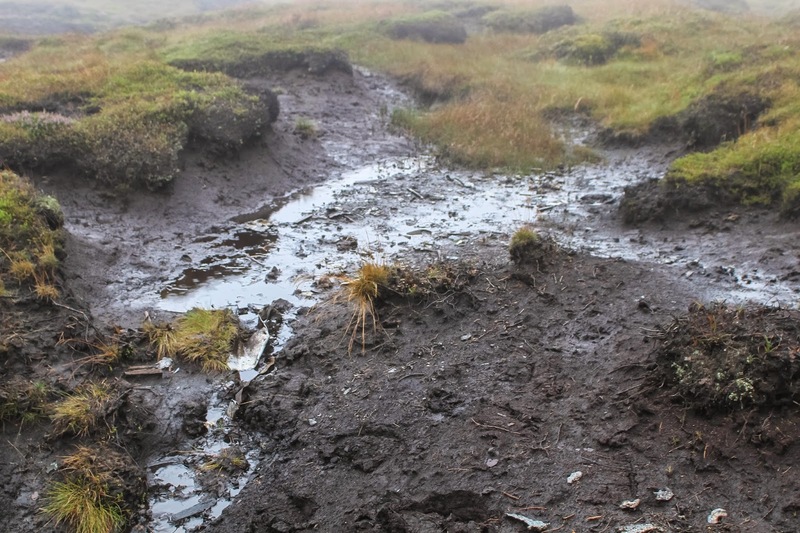 The moor is a watery bog of a place unfit for humans ! Flying out of RAF Lindholme on the 20th December 1948. The Lancaster crashed into the hillside on the stroke of midnight . It was engulfed in flames except for the tail section which had snapped off and been thrown clear from the burning wreckage .One of the crew initially survived the impact only to die within an hour of the crash. His watch had reportedly stopped at 10 seconds to midnight . F/Sgt. V. Graham Flt. Eng. 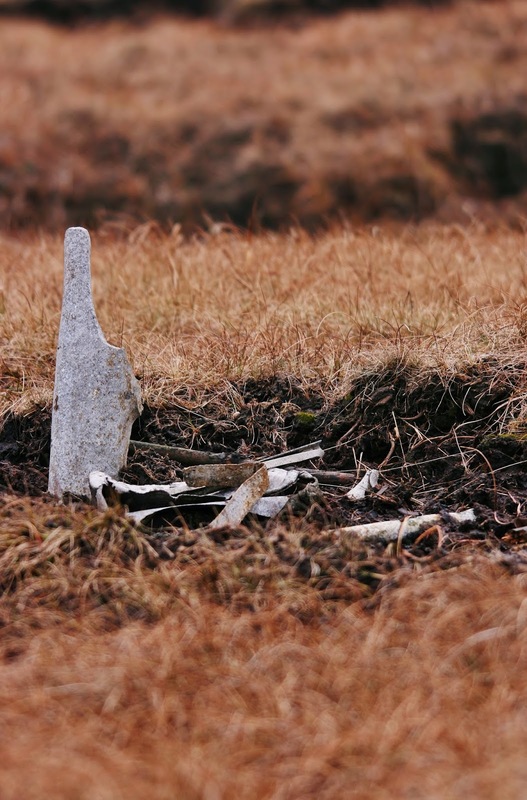 Quite an amount of wreckage remains at this site , not only at the main pool but scattered across the moor . 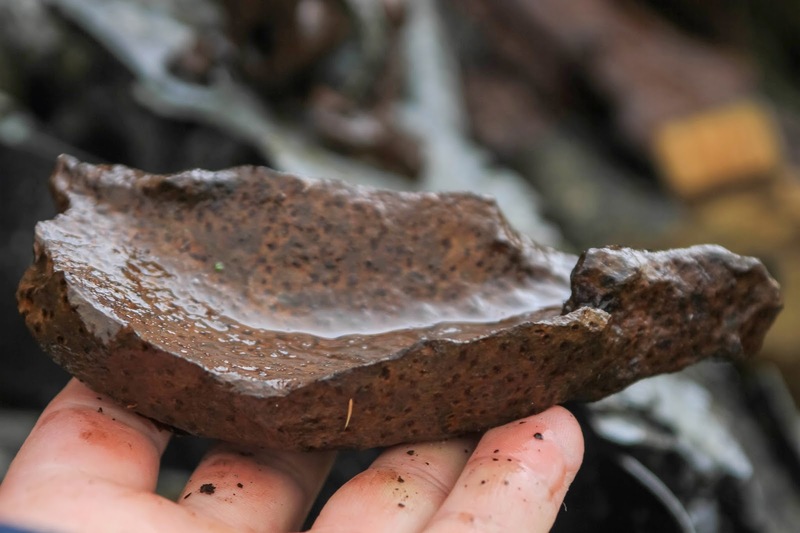 In one of the gullies burnt fragments and shards of perspex and glass can be seen indicative of an impact point (but not confirmed). This uncommon aircraft had a poor reputation largely deserved . 442 were ordered by the RAF in 1936 to provide cover for Coastal Command , Torpedo attack, bombing and reconnaissance were its intended duties. Unfortunately it never had the engine to suit its weight . Four aircraft were lost between March and July 1940 and its bad reputation was sealed .Only 30 aircraft actually entered frontline service , only one being lost in the 3 months of that service before being withdrawn . They went on to be used as trainers but proved unsuitable for this role too , eventually ending life as target tug aircraft . This aircraft was a new one en route to No.48 Maintenance Unit at RAF Hawarden , on the 10th December 1941 . 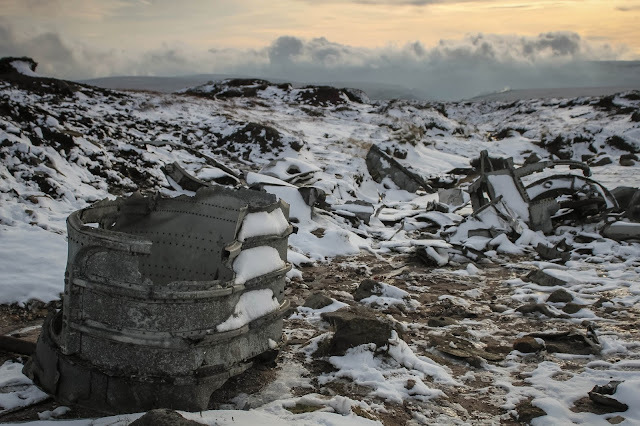 The aircraft crashed into Round Hill on Bleaklow in the Peak District in bad weather , nothing wrong could be found with the aircraft and it is assumed that the pilot was trying to fly between the cloud and hillside when he crashed . The pilot , sole crew member on this ferry flight was killed. 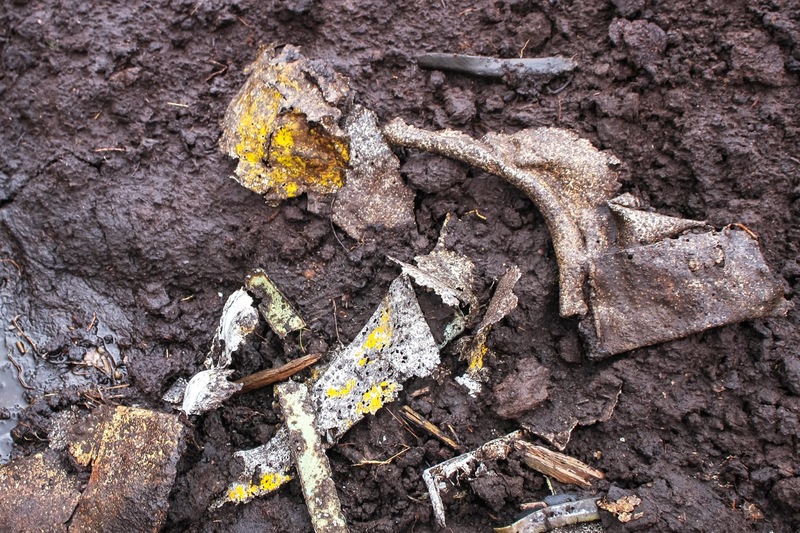 Two large wing sections remain on site with a plethra of smaller fragments surrounding them and scattered in a number of grougths which radiate out from the hill top crash site . All those years ago, a life or death struggle at the time, now just a part of our history that some people take for granted, all that is left of a youthful sacrifice gladly given, small bits of debris. We must never forget these brave boys, ( for they were indeed little more than boys ) and hope that if ever England has need of them again, their spirit will awaken, reborn, and come to our aid once more. 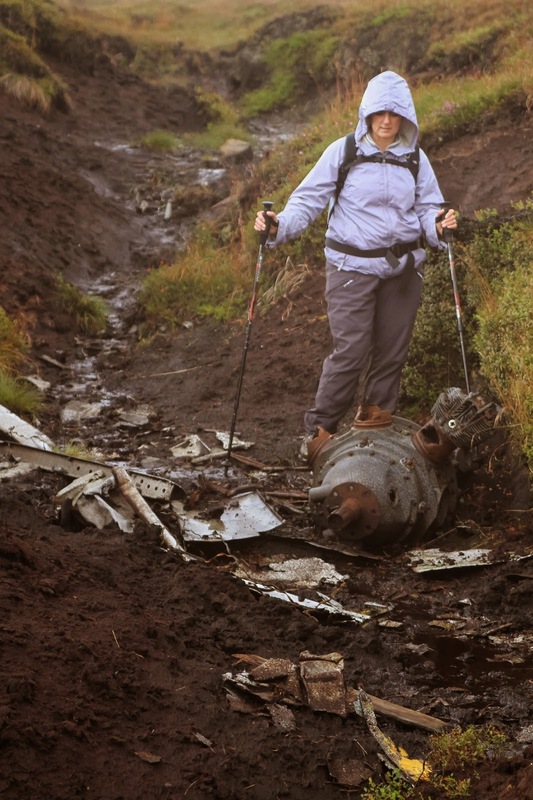 I remember about 55 years ago, climbing Kinder with my local hiking club and finding rusting aircraft parts and in one place, a part of a wing with the skin peeled back and exposing a thick stainless steel pipe. It was in perfect condition, without weather damage. there were pilot seat frames, racks that had held instruments and monitors, engines and lots of water-filled craters. I have never forgotten the sadness I felt over half a century ago.